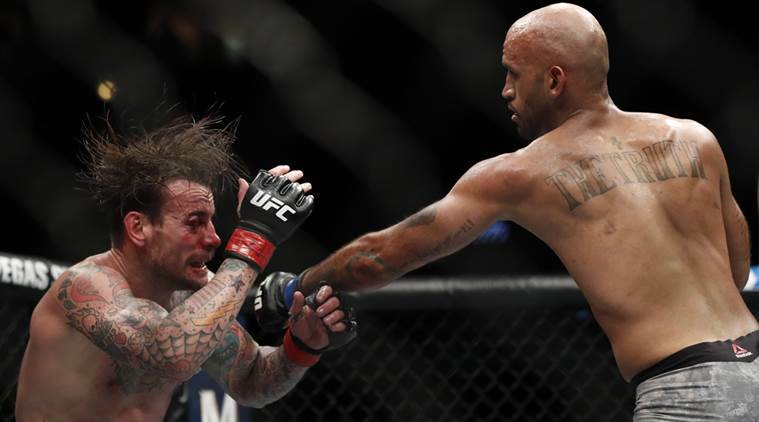 CM Punk lost his second MMA career fight against Mike Jackson at UFC 225 via a unanimous decision by the referees. Former WWE World Champion’s Phil Brooks, who goes by his in-ring moniker “CM Punk” suffered yet another heavy loss in his second mixed martial arts bout in UFC 225: Whittaker vs Romero 2 on Sunday. Punk, who suddenly left WWE in 2014, after reportedly getting frustrated by the creative direction of the company, signed up with UFC in December 2014. But his transition from a professional wrestler to a mixed-martial athlete suffered a setback after he lost his debut bout against Mickey Gall in September 2016. Punk returned to the Octagon after a span of almost two years, hoping to reignite his career, but failed to go past Mike “The Truth” Jackson. In a fight that exposed limitations in the arsenal of the self-proclaimed “Best in the World” in the world of MMA, the 39-year old was outclassed in almost every department. From the start of the match, Punk failed to get the takedowns to Jacksown despite repeated attempts. He successfully managed to take one takedown in the first round but got his nose bruised in the process. By the middle of the fight, a battered and bloodied Punk appeared to be exhausted and out of breath. Jackson, in the second round, took down Punk towards the fence with a hand overhand. Punk’s attempt to lock up Jackson with a guillotine turned badly when the latter counter-attacked and got on top of his opponent for a round of ground-and-pound attack on the face. A bruised and exhausted Punk tried to go for multiple takedowns in the final round, but a cocky Jackson continued to land straight punches on his opponent. After the three rounds of fight, the judges voted unanimously in Jackson’s favour as he picked up his first UFC win. The former WWE wrestler left immediately after the result was announced and did not stay for the post-fight interview. Punk’s second straight loss in UFC takes his results tally in the brand to 0-2. In the main event of the night, Middleweight Champion Robert Whittaker edged past Yoel Romero to retain the title.